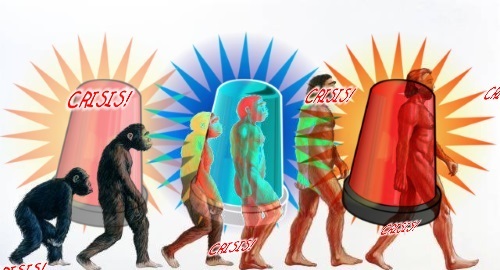 Ever since Darwin published On the Origin of Species by Means of Natural Selection, or the Preservation of Favoured Races in the Struggle for Life in 1859, his version of evolution has undergone a series of crises. His book underwent revisions, and he admitted that his story had serious flaws (such as the fossil record). As time went on, those pesky facts of science showed that it's not valid. Traditional evolution by natural selection was abandoned. Not willing to admit failure in light of new scientific evidence, the view became the Synthetic Theory (neo-Darwinism), where mutations were added to natural selection. Evolutionists are not in lockstep, and controversies continued. Some admitted that there was no evidence, but hey, there's no Creator God in their worldview, so they proposed a different idea that also has no evidence: evolution happens in bursts. The cell, genome, epigenetics, and other continuing discoveries further show that evolution is not supported by scientific evidence. They are proposing the Third Way (not to be confused with Buddhism's Middle Way). Sure, scientists have learned a great deal over the years, and have many tools at their disposal. It should be easy to make this idea take hold. Not happening, old son. To read about the latest attempt at damage control, I suggest you click on "Evolutionary Crisis and the Third Way".